FRANCE HAS JUST BEEN THROUGH PRESIDENTIAL AND LEGISLATIVE ELECTIONS IN A COMPLETELY UNPRECEDENTED SITUATION: The traditional political parties have exploded and the whole political landscape is reshaped, as much on the right as on the left. This situation crowns 5 years of socialist-led government characterised by the steady abandonment by Francois Hollande of his 2012 programme; characterised also by political and social regression, and the imposition of neo-liberal measures like the destruction of the industrial patrimony of the country. There was the territorial reform and the reform of the Labour Code, the concentration of power. Then the State of Emergency was declared with the deployment of the military in many [foreign] countries. 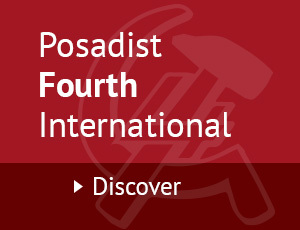 Over these 5 years, the Socialist Party was pulled apart. From election to election, it suffered immense losses in terms of militants and officials. In parliament, its left-wing was opposing many of its measures. In this political context, and after the many struggles of the social movements in 2016 – that did not amount to much – the year 2017 opened for the left on a note of some gloominess and uncertainty. Its difficulty was in re-defining its programme and new forms of struggle in a spirit of unity. In February, the movement of France Insoumise was launched by Jean-Luc Mélenchon. He made the Parti de Gauche the pattern for this France Insoumise, but this narrowness provoked doubts and divisions. It might have been better to dissolve Front de Gauche (FdG) and re-incorporate all the forces. Many appeals were launched for a common front between the various sectors of the left. Such a front was needed to reverse the balance of forces in a way conducive to economic and social transformation. Attempts were made but they did not prosper nationally. For the Legislative elections however, some unity was achieved at local levels. In some regions, it led to very interesting developments because, for the first time in many years, people could vote for a programme to transform society instead of just voting against the right. Things were not better in the right-wing spectrum of politics. In its Primaries, the Party of Les Républicains made quite a show of its divisions. Nicolas Sarkozy was eliminated as candidate. Then his Party leader Alain Juppé was eliminated too, to the advantage of Francois Fillon who won the candidacy for President. Fillon represents a sector of the old Catholic and bourgeois right wing. He belongs to the movement “La Manif pour Tous (LMPT)” opposed to homosexual marriage. In this context of division and debilitation both on the left and the right, Emmanuel Macron ditched his post of Economy Minister in the Socialist government of Francois Hollande. He formed his own En Marche movement on 6.4.2016, and from that new movement, he stood as candidate for the presidency. He was going to win and become president on 8.5.2017. Prime Minister Macron is a pure product of neoliberal capitalism. He invented the En Marche movement on the pretence of belonging to no Party, and of being neither of the left nor of the right. He wants to draw closer middle classes and employers together. His words are now beamed in all directions through publicity and marketing campaigns relayed by all the medias. By ‘more change’ he means more neo-liberalism. His threat to pass his reform programme through ordinances does not bode well for democratic debate in the National Assembly. The first round of the Presidentials led to the elimination of the two biggest parties in the government – the Socialist Party and Les Républicains. For the second round of those elections therefore, only Emmanuel Macron (and En Marche) was there to stand against the extreme-right National Front (NF) of Marine Le Pen. In this second round, the medias gave a hard time to the NF. They played on the fears inspired by the NF, but Macron’s neo-liberal policies are the compost that feeds the NF. This is how Macron won with 80% of voter participation. In the end however, this was only some 20 million votes for Macron and only 43.6% of the 47 million who voted. This left 12 million people abstaining, voting blank or spoiling their ballot. It is important to note that the left represented by Jean-Luc Mélenchon and his France Insoumise movement had a spectacular development too. It collected a little over 7 million votes, and reached very high scores in the popular areas of the big towns (sometimes above the 40% mark). And this happened in spite of campaigns of vile calumnies and denigration all the way up to 10 days before the first round. In the polling surveys, the majorities for the bourgeois-and-employer class could swing from 10% to 20%, due to their panic fear of Mélenchon. They called him “the French Chavez”, “the Revolutionary Communist” and “this pro-Putin who likes totalitarian regimes”. Francois Hollande joined the fray when he stopped attacking the extreme right to attack the perils of Mélenchon programme. The NF was eventually forced to revise down the forecasts it had made for the much greater expansion of its electorate. If it won an extra three million votes, it is partly through the support of an old Catholic right-wing previously close to Les Républicains. On the right, the Party of Les Républicains showed the depth of their crisis as news of scandals kept coming about their corruption, misappropriation of public funds, misuse of public wealth, etc. Their candidate Francois Fillon continued campaigning (for president) as if nothing was happening; but this caused a falling-out in Les Républicains that ended up with a sector of them joining Emmanuel Macron’s En Marche. At the Socialist Party meanwhile Francois Hollande decided not to stand again for President. The Primaries that followed this action saw the accelerated departure of previous Socialist heavy weights like Manuel Valls. The Socialist left perked up when, in the Socialist Primaries, Benoît Hamon was chosen for presidential candidate. By supporting him, the Socialist base had rejected years of Socialist government. 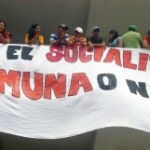 This event highlights also the rupture that has taken place between the Socialist leaders and the Socialist base. That rupture is between a social-democracy incapable of reforming the capitalism, and a Socialist-inspired Party base set against the reform of the Labour Code, the vanishing individual and collective liberties, the State of Emergency, persistent unemployment, etc. In all this crisis, some Socialist leaders abandoned the Socialist Party to join the Macron’s movement, whilst at the same time fighting fiercely against Benoît Hamon, the Socialist Presidential candidate of what had been their Party. This made a complete job of scuttling the Socialist Party. The campaign against traditional parties and party apparatuses was followed by Emanuel Macron setting up in government and the preparations for Legislative elections. When Emmanuel Macron chose his prime minister from the ranks of Les Républicains , this further deepened the latter’s internal crisis. 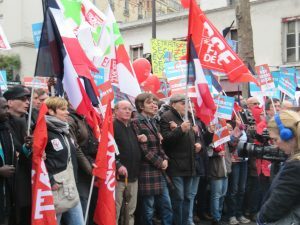 On the left, and in spite of many efforts, no common platform could be made at national level between France Insoumise and the parties of the Front de Gauche (French Communist Party and ‘Ensemble’). No common cause was made either with the Socialist left of Benoît Hamon, with the danger – which materialised – that socialist members may give up or remain voiceless in a sea of abstentions. Indeed abstention reached the record level of 57.4%. However the left made fronts in some regions. Where various left candidates joined forces, they won some more MPs than announced in the polls. There were 557 seats to fill in the National Assembly. In alliance with the centrist Mouvement Démocratique (MoDem), Emmanuel Macron won 350 of these. Although this comfortable majority maximises his power, he did not get what he wanted. His MPs of ‘the République En Marche’ did not there through mass support. The new feature of the National Assembly in the wake of those elections is that its majority won with less than 43% of the vote. Macron’s power does not mean he has legitimacy in a large part of the electorate. The new MPs are supposed to represent civil society, but many are business cadres from private enterprise and the liberal professions. If they were vetted for morality and political correctness, they have little political experience. Not many of them ever held posts of responsibility. They were so ‘green’ on arrival at the National Assembly that the government put them through programmes of accelerated formation. Mind that this is no guarantee against corruption or ‘business deals’. Proof of this has already been provided by the resignation of ministers suspected of wrongdoing. Les Républicains are down to 136 seats compared with 199 in 2012. The Socialist Party salvages only 45 seats from its 292 in 2012. On the left, France Insoumise and Front de Gauche obtain 27 seats, of which 11 come from the Communist Party (PCF). In many decisive centres, the Communist Party made spectacular progress against Macron’s En Marche candidates. The PCF has 3 more seats than in 2012. What perspectives now for the left? Now the question is to know how to re-compose the left and the means it will want to unite. The Legislative elections have proven the existence of a real thirst for change in the population. This expressed itself in the abstentions, the blanks and the spoiled ballots. It expressed itself also in the vote for France Insoumise (Mélanchon) and the efforts of the left to overcome cleavages and divisions between France Insoumise and the left parties. 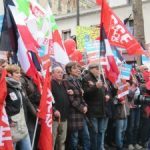 In the second round of the Legislatives, the Left vote coalesced around France Insoumise; it is the only force that can to unite the left on a programme of economic and social transformation. This was clear in the areas where the candidates of En Marche could be defeated. The present conjuncture has shown that the votes that went to the National Front (NF) were a form of protest. Even if the NF increases its audience in some places, rural ones for example, it is in regression overall – contradicting the idea that the working class would vote for the right. The vote for the NF was 7.8 million in the first round of the Presidentials, but it fell to 3 million in the first round of the Legislatives. Hence the NF did not advance. The reverse is the case. It is France Insoumise that raised its score, particularly in the neighbourhoods of the large towns. The appearance of a personage like Emmanuel Macron – emerging from nothing at all – shows a depth of crisis and decomposition of the bourgeoisie. The latter can no longer trust its traditional organisations. It needs a new image to implement the reforms it has in mind. We shall see how this movement will to evolve, given its very heteroclite composition. Will it stay the course when summoned to approve measures insufficiently discussed? The absence of democracy can have its limits! One must start from those elements to rebuild a new and more open left. A left less dependent on apparatuses. A left that welcomes political expression. There is much ground left to cover and many discussions still to have regarding the matter of how France Insoumise can develop and give room to other formations and parties. A new field of political intervention is opening in the country. There is much questioning and perplexity in people about the future. The unification of the all forces of the left is a necessity to counter the anti-social and anti-democratic measures of Emmanuel Macron and his government. Preservation of the public sector, defense of small enterprise, creation of an investment national bank, etc. 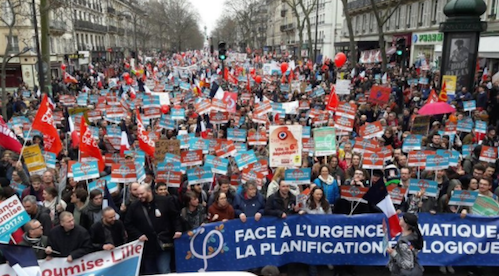 Social movements in France: Many new forms of struggle have appeared in France capable of mobilizing people around issues with civic dimensions: anti-racism, the movements of the unemployed, solidarity with the ‘sans’, etc. Jean-Luc Melanchon, born 1951. Joined the Socialist Party in 1976. Left that Party in 2008 and founded the Parti de Gauche. Made a United Front with others and founded the Front de Gauche in 2009. Became MEP, and in Feb 2016, created France Insoumise. He stood for President in 2017 and won 20% of the vote, arriving fourth. He is now an MP for France Insoumise from the Bouches du Rhone where he won by 60%. Mélanchon created the Parti de Gauche in 2008-9. He left it behind to make the Front de Gauche (FdG) for the European Elections of 2009; now he has left the FdG behind to create France Insoumise. FdG still stood in the elections. It contains the PCF and Ensemble. Valls was Prime Minister in France 2014-2016.